Too Busy to Meditate? What If It Could Actually Save You Time? As legal professionals we spend a lot of time in our heads, and meditation is an easy way to make that time more efficient , not just by relieving stress when it happens, but by being mentally ready for it before it happens. What if I were to tell you that the time you spend meditating will *save* you time? New York-based Broadway professional-turned-meditation teacher Emily Fletcher knows all about getting the job of one’s dreams then being overwhelmed by stress. Read what Emily has to say and see how some basic meditation techniques can help you do less and accomplish more. Read on and find out how. As the blog has been making its way through a multi-part primer on dressing like a lawyer, we’ve touched repeatedly on the importance of tailoring. The axiom is: if the suit doesn’t fit, don’t wear it. We have assumed that young lawyers’ budgets will require them to buy off-the-rack suits and shirts and tailor as needed. But now slimmed-down styles, inspired by the custom tailoring of London’s famed Savile Row, have come into vogue, shouldering out the boxier styling traditional to the U.S. With that trend has come a surge of interest in skilled custom tailoring. So, it seems appropriate that we briefly review the full spectrum of business attire customization. Looking like a Lawyer, Part 2c: Men’s Accessories. by Leo M. Mulvihill, Jr. This is the fourth installment in a series on cultivating a lawyerly image. The first discussed sartorial fundamentals for female lawyers; the second considered men’s suits; and the third examined men’s shirts. Today, we review how to choose appropriate accessories to complete your professional ensemble. Your suit’s on the hanger, your shirt’s freshly pressed, and you’re just about ready to head out the door, right? You’re not completely dressed until you’ve completed the ensemble. You’ll need at least a tie, and maybe a tie clip to go with it. Depending on your shirt cuffs, you may need cufflinks. 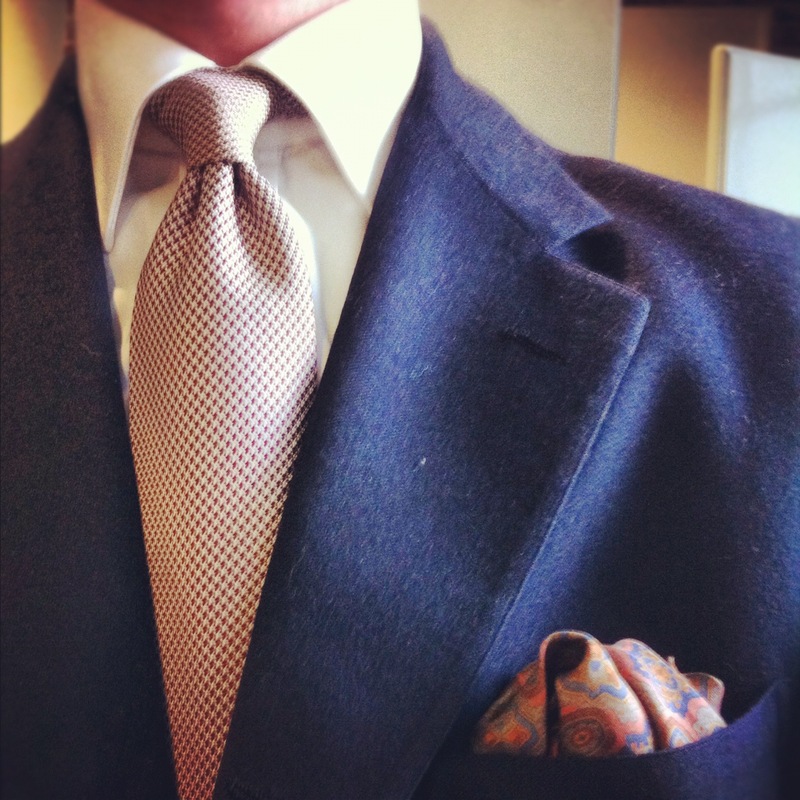 While you’re at it, that breast pocket is looking pretty empty — maybe consider a pocket square. Bottom line, there are some additional items to consider when getting yourself together in the morning. Let’s run through some basics to pull together your look: ties, cufflinks, and pocket squares. This is the third installment in a series on cultivating a lawyerly image. The first discussed sartorial fundamentals for female lawyers and the second dealt with men’s suits. Guest contributor Leo M. Mulvihill is a partner at Mulvihill & Rushie–The Fishtown Lawyers. He has written widely on style for Art of Manliness. This is his debut on the PhiLAWdelphia blog. After following the sage advice in Looking Like a Lawyer, Part 2a, now you have a suit that fits you well, and makes you look and feel like a million bucks. But unless you want to go to court looking like a Chippendale’s model, you’ll need to have a nice arsenal of shirts to wear with your suits. If you’re in the type of office that requires you to be in a shirt and tie every day, you’ll probably want to have at least 10 shirts to rotate so that you’re not doing laundry twice a week — or worse, wearing dirty shirts to work. Below, I’ll discuss some hints to make dressing in the morning as easy as possible for you, while ensuring you always look put together. My goal throughout this article to keep it simple and classic – almost to the point where you could reach into your closet, without looking, and end up with a suitable outfit for court. Building Your Professional Shirt Wardrobe. I’m going to take all of us back to our bar exam studies. Remember all those mnemonics your lecturers tried to make you remember? Well, neither do I. But when shopping for shirts, we can distill everything down pretty simply to the 5Cs of what you should consider – – 1) Color; 2) Cut; 3) Cloth; 4) Collar; and 5) Cuffs. Executive Board member Maria E. Harris recently posted on key points for female lawyers to keep in mind in cultivating a lawyerly image. This installment discusses the same topic with a focus on men. Part 2a deals with suits. Part 2b will deal with shirts, ties, shoes, and other accessories. It’s the rare client or fellow lawyer that will judge you favorably for being a style maverick. People expect lawyers to look the part. There is no one way to be an excellent lawyer—as legendary trial lawyer Bob Mongeluzzi counsels, you ultimately have to be yourself to achieve your lawyerly potential. The same goes for your visual presentation. You can never go wrong with a simple, neat, well-fitting, comfortable ensemble. If you look competent, you will enjoy a presumption of competence (albeit a rebuttable one). But, to the extent you individualize appearance, make sure it’s consistent with your personal style, your practice and your audience. Whether you’re cerebral and understated or bold and outspoken, dress the part. By and large, lawyers dress differently in the courtroom than in a document review room. No jacket or tie might be OK in Silicon Valley, dressy cowboy boots OK in Houston, seersucker OK in Atlanta and probably none of the above at a white-shoe firm in the Northeast. To this day, My Cousin Vinny is unrivaled in highlighting with comedic artistry the importance of tradition and context in lawyerly dress. As you work to find your style niche, try to find lawyers whom you respect and emulate them. Every lawyer needs to be able to dress formally, even if only occasionally, so the following guide will focus on making sure are able to do that with aplomb, starting with suits. Once you have formal attire handled, you can dress down from there. When I was in high school, we had an “open campus,” which meant that, because our cafeteria wasn’t big enough to handle all the students eating at once, students could leave school and eat elsewhere. Problem was, “lunch” was 35 minutes long, and the school was in the suburbs, so the social landscape aligned itself such that those in power were (1) of legal driving age and (2) had a car at school. But even if you were lucky enough to know such a feudal lord or lady, there weren’t many good options nearby, and by “good,” I mean “good” by the definition of a bunch of 16-year-olds in Michigan, which is to say “deep-fried meat and/or pizza.” The Shangri-La of lunch places was The New McDonalds, which opened during my senior year. If you knew a kid with a fast car, a general disregard for the personal safety of himself and his passengers, and the organizational precision of Danny Ocean, you could just barely get there, eat and get back for Fifth Period. It made lunch the most exciting meal of the day. We would race into Honors English conspicuously draining a 44-ounce pop (remember, this is the Midwest) and everyone would know that we pulled off yet another high-risk caper. Nowadays, I usually eat a salad at my desk. This is the first of a two-part series on cultivating a lawyerly appearance. Author Maria E. Harris is a member of the Young Lawyers Division Executive Committee. The following tips are based upon interviews with female attorneys selected for their reputations as classy, professional and stylish members of the bar. They range in age from thirties to fifties and have practiced in a variety of settings, from government to private practice, both plaintiff and defense. Know your audience. Dressing as an attorney depends not only on who you are but also whom you are interacting with. It can vary depending on whether you are going to court, a networking event, appearing at the office or simply going to dinner with co-workers. Just because it’s technically within the dress code doesn’t mean it’s a good idea. Having interviewed partners in their 40s and 50s, I have an intimate view of the expectations for dressing as a young woman attorney.